I like cauliflower and this recipe looks great! I’m old enough to know when people would boil the ‘living hell’ out of cauliflower, turnip and broccoli – which was really a shame because, when cooked properly, they’re delicious. As you know !!! Wow 4 apple pies! That’s awesome. 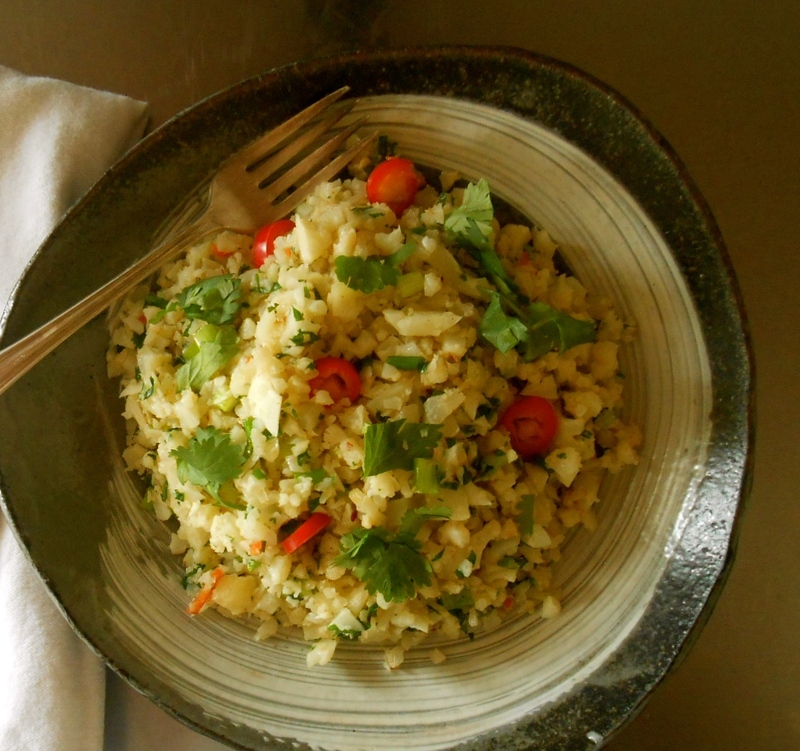 I love this cauliflower recipe because of the jalapenos and lemon. But your flavor combos here are perfect. I’m going to give this a shot. Hope you’re doing well! Hi Amanda! This is seriously good. I have used lemon and lime for this and it’s equally delicious. I must say that hand chopping the cauliflower is a task, especially with the little bits falling all over the floor! I hope raw cauliflower is ok for dogs. :) Sometimes I wish I had a food processor…but then, it’s always a pleasure to handle the food and take your time preparing it, right? Always great to hear from you! I like the way you cook, repetition is good. Checked out the taste food blog and fell in love instantly, thanks! Happy Holidays to you and your family!! I’d say fantastic timing. This is a brilliant way to eat cauliflower. You will absolutely love it Karen. Thank you for stopping in this morning. :) Hope you have a wonderful Thanksgiving! Sounds fantastic and I’ll take one apple pie, please. Hope you have a lovely Thanksgiving! That’s funny, I do a lot of repetition with recipes too. This looks like a great way to eat cauliflower and give it flavor! It’s a great way to really learn the dish by heart. Definitely a great cauliflower recipe. Thank you! With four apple pies you could almost pop one in the mail for me!! This is such a good recipe full of flavors Seana! So aromatic and so good! Seana, i miss your presence often on wordpress! My interaction has gone down. But recetky i made anither dal n naan combination and dedicated to you :). Do check that when you get time :). Really? I will come over and visit. :) I have made chana dal several times in the past few weeks. My son can’t get enough of it. It’s his favorite dinner right now. Last night I made a wonderful chickpea recipe and for the first time I mixed ras el hanout. Hope the photo’s turned out because I hope to post it. I’ll try to keep in better touch! OMG your son ate an entire pie in one night? You are a scary window into my future as my 10 year old already eats like a horse. Love the sound of the cauliflower recipe. Lemon + red pepper flakes is one of my fave combinations. I’m yet to try ricing cauliflower but you’ve inspired me. PS. Seana, I am *loving* my Oxo Julienne Peeler. Thanks for the tip. Lately I’ve been making carrot ‘hair’ for my boy’s amusement. Love the sound of carrot ‘hair’! :) We are constantly using the julienne peeler. Just the other day we julienned carrots then chopped them into little bits for a salad. It was my son’s idea…he made us a BLT salad for dinner. And yes, your day is coming…a whole pie goes down quite easily for a 16 year old boy! It’s unbelievable. It’s always nice to stumble across a recipe that has been tried and tested. Somehow, it makes me want to make it all the more. :) This cauliflower dish looks fabulous, Seana. It sounds deliciously spiced as well – I love a bit of heat! Thanks for sharing the recipe. 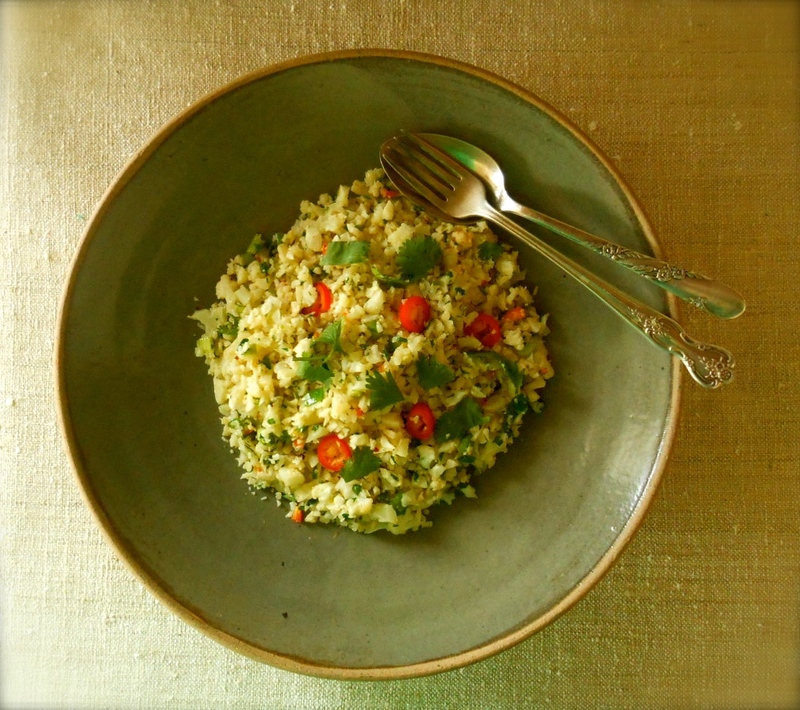 I have been all over the cauliflower “rice”. First I was mashing them like potatoes with garlic and olive oil- and now it’s grating- Not only does it taste good but I can eat like a whole head of it without guilt… (except for the bubbly tummy). Now there’s a good idea…grating the cauliflower. Much easier than my method of finely chopping the whole head! I agree. I could eat the whole head too, and then wonder what caused the grumbly stomach! Actually mashing them like potatoes sound really good. I think I’ll try that, especially with garlic & olio. Thank you Wendy! I’ve grated by hand which is really nice- but in the processor is definitely easier… it just gets a little more mushy than ‘rice’. I just adore your cauliflower dish Seana, cauliflower rice or cos cous is wonderful, the dish sounds so flavorful. 4 pies, you go girl, apple pie is one of my favorites. Isn’t cauliflower just great with lemon? Recently I made it with lots of spice – shop-bought! Was feeling lazy that night and couldn’t get it together to dry roast and grind spices so I chucked in already made curry and garam masala powders (plus others) and it turned out really well. Making that again this weekend. Like you I love repeating certain recipes. Oh, you make me laugh! I was the same as your son. If I couldn’t sleep I’d raid the scullery (pantry) and wolf through family sized tins of fruit. Would still do that! I am not surprised that your son ate the first pie overnight. Those appetites are unbelievable!! 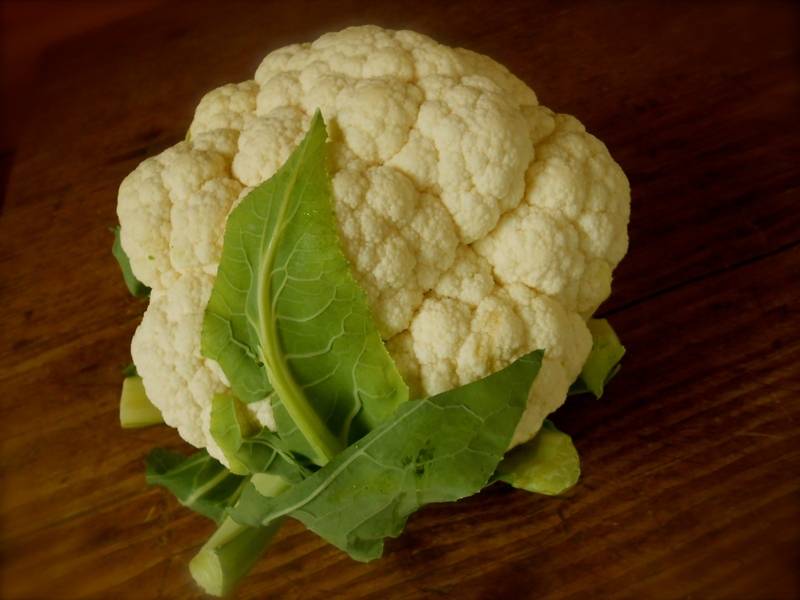 I love the flavours in your cauliflower and must try it when I have my veggie friend round though I do think this would be nice with fish too. Now I have to go off and deal with my craving for apple pie!!! 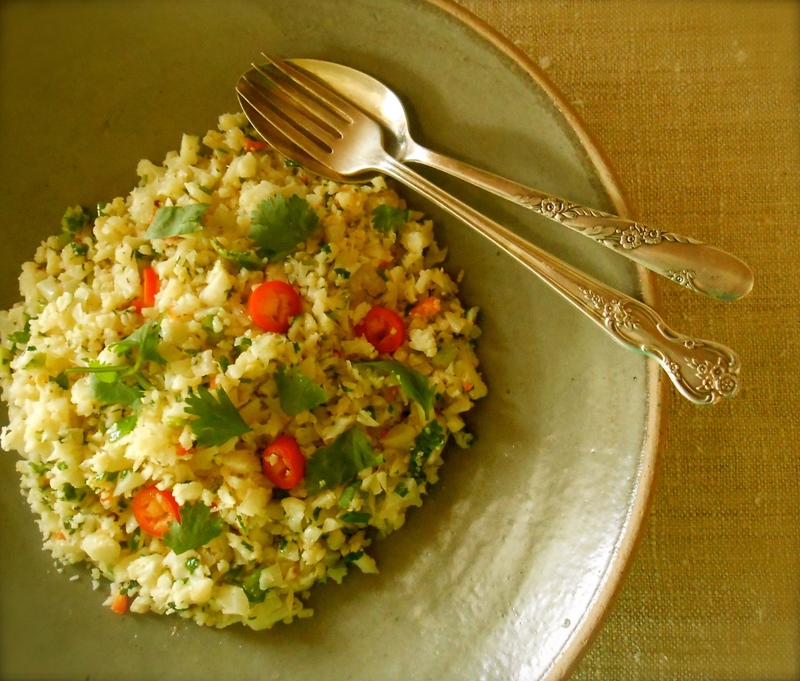 Have not done cauliflower “rice” before, but looks like a yummy alternative, and versatile! Thanks for sharing!! Ha! My mother used to do that. She’d find a recipe she loved. We’d have it over and over again for a few weeks, and then she’d be sick of it and it would never return (much to our dismay)! That one looks like a real keeper though. Looks great! So interesting how the flavor of cauliflower changes with the cutting. I’ll have to try this recipe! I agree. It isn’t so pungent and loses that really strong cruciferous flavor. It’s mild and nutty. It’s good! “Repetition is the mother of skill”?? I think you’ve coined a new phrase!! I do that rerun thing too. If I like it, I think everyone else who crosses my table should give it a try! oh, and the cauliflower looks super!! Hope you have the best Thanksgiving with your family there Seana– I know they’ll eat well!! I have the same thing about remaking a new found recipe over and over in a short period of time. True, it’s practice and when you like something, it’s hard to resist. This cauliflower recipe looks so tasty. I really want to give it a try. I hope you try it. It really is something special. You’ll probably find yourself making it over and over too! A lovely cauliflower dish! yesterday, we ate cooked cauliflower mashed with fresh rocket leaves & sundered tomatoes & home-made sliced up chicken meatballs! It was divine too so I now that I must love your beautiful dish too! Love this Seana. I think cauliflower is such a versatile vegetable. So many ways to use it. I love it with curry seasonings but chili and lemon sounds BEAUTIFUL. Remember I was supposed to make cauliflower risotto? I thought of you when I chopped the cauliflower up to make aloo gobi instead. I’ll get there yet. Also love the story about the apple pies. I don’t know winesap apples but I do know and love honey crisp. I also tend to make things over and over until everyone asks if I can make anything else. I’m stuck on fruit crumbles at the moment – some of the garden rhubarb (frozen), a couple of nice apples sliced, some fresh cranberries, some frozen blueberries – no sugar – and then a topping of oatmeal, brown sugar and butter. I make it over and over and over. SO tart. So tasty. But never mind me – this is supposed to be about you! ;) Great post. And happy to see you. I had to chuckle because I love to hear from you and about you! Sometimes I think you and I are cut from the same mold. :) I do remember you were going make cauliflower risotto and I hope you still do. Your crisps are right up my alley. I love tart with oatmeal, brown sugar and butter. I think it’s a perfect combination. And I am especially keen on the “no sugar” part for the filling. I barely sweeten my pies and crumbles, even pumpkin pie! I’m headed over your way now to see if I’ve missed a post. Have a lovely day Lindy. Seana, I love the recipe, so simple and delicious! Beautiful pictures!! Apple pie? Oh, my. My mother spent years perfecting her pie crusts. We had pies every week. My favorite were the apple ones, because I loved how the spices melted into the crust. My parents would wake up to some mouse have eaten all the crusts, having left the filling in the pie tin. I understand how your son ate the whole pie in one sitting. When you start, it’s hard to stop. That cauliflower salad looks very refreshing and a super nice change to cooked cauliflower, which I love too. Hi Janet! Great to see you with a new blog! I was wondering what your next project was going to be after your Happy Days. This is a wonderful idea and I look forward to reading your stories. Funny story about the mouse eating the pie crust! Happy Thanksgiving to you! I love cauliflower, cooked or raw.. it’s always worth have it in the fridge! Thanks a lot for this salad, I’m going to make it asap! Thanks for the name of the other blog, I like discovering new “spaces”! Hi Seana! Another tasty veg-recipe! :)I love cauliflower, too, make cream-soups and bakes pretty often, but never tried such ‘rice’ version, sounds really nice and with all those flavours! yum! I really seem to be into cauliflower lately. This sounds delicious. Hugs! Hi Teagan! We have really been into cauliflower too! You just have to try this if you love cauliflower. So delicious and nutty. Thanks for stopping in ! I love the flavours here as well as the idea of chopping up the cauliflower so finely (something I’d never have thought of doing). Sounds delicious! This recipe is for me! I don’t like cauliflower, so if I try it made this way I might end up enjoying it! Thank you! :) Hope you find a chance to try it, it really is wonderful. Will do =) Have a lovely day! I just realized I hadn’t stopped by for awhile and I got the biggest kick out of this post – I get “stuck” too, too, often on recipes – whether they are just so good I have to have them again or whether I’m just trying to perfect! And I wonder, could our sons be related!!?? LOL! I had tried a dish something like this once, but it didn’t have all the flavorful elements – I can’t wait to make it! I’ve never heard about this way of eating cauliflower, but since I love it a lot raw, I bet this recipe suits perfect my taste! So easy and so original! Sorry, I sent the message before finishing it… I wanted to say that finally I’m going to prepare it tonight! I have a new food processor… I will let you know! You are so sweet Karinna! Thank you for leaving me such a kind message. I am working on getting some posts together. It amazing how missing a few monts really takes so much effort to gain momentum again. I miss posting and talking with all my blogging friends. :) Nice to hear from you! You are currently reading cauliflower with lemon and chili’s at COTTAGE GROVE HOUSE.